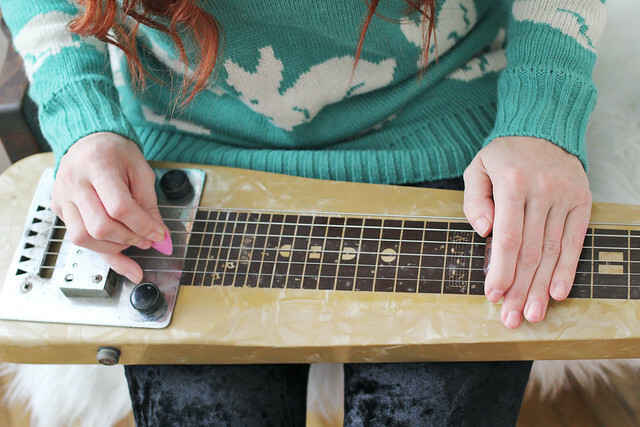 One of my New Year's Resolutions was to learn to play slide guitar-- specifically, the lap steel. Our best friend from way back when used to play lap steel in our old band, and it seriously made every song way more beautiful. I'm happy to report that I'm trucking along nicely and it's a great feeling to be pursuing something purely as a hobby. I like making time for hobby stuff-- I should do it more often! It's weird starting fresh at something and being kinda bad at it (I like being GOOD at things! ), but it also keeps you humble. I like humble. It's a good quality. Yay for starting new things! I also have the same feeling about not liking to start things and being bad at them. Currently I'm persevering on knitting although the first feeling was that I was not that good at it! :) Your bunny sweater is adorable! Way to be awesome and keep learning and trying and doing. I think it's great for you and also great for your girls to see in action. it's so fun to learn a new skill or pick up a new hobby. you should record a video of you playing when you feel comfortable. i'd love to hear it! That is great you are learning to play a new instrument. A few years back I tried playing guitar but I had very little patience for learning. I want to magically be good at it and I know that is not the case. Even if it's only a hobby you still need to dedicate time to learning and getting better with time. Oh interesting, I hope you'll post some videos of you playing it once you get more comfortable with it! It looks very cool. Awesome job mama! Do you guys go barefoot in your house too? I grew up in Hawaii and am asian so its common for me- always weirded out when I go to a friend's house with my shoes on though! I can honestly say that I've NEVER heard of a lap steel slide guitar. After looking it up though, I can see why you'd want to pursue such an awesome sounding instrument! I miss playing music and I should probably start playing again soon! 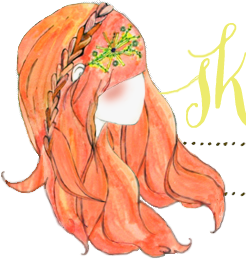 Also, I LOVE those hairclips!! I just said to my husband the other day that we should get a lap steel. Best of luck on your journey! I have never heard of a lap steel slide guitar but well done! I use to love playing music i should try and get back into it. I love your jumper too, it's so cute. The Bunny sweater is adorable! Umm yeah, that looks like an awesome hobby. I think my husband needs himself one of those fancy lap steel slide guitars. I LOVE that sweater. And that is definitely a cool new hobby! That's a pretty cool goal. Also, that bunny sweater is so adorable! I hope more are made available. I love your sweater! The back with the bunny tails is so adorable! That is very cool! Slide guitar is seriously beautiful and really does add to music. And that bunny sweater is the cutest! oh gosh. i am humbled by so many things! i'm taking up french again (thanks duolingo)! and it's a challenge sometimes to come home after a long day in the lab at work and 'turn my brain on' again in a different capacity. i want an omnichord so bad! i also love lapsteel, you're right it's just such a nice added tone bonus in a song! hard to miss too! p.s. i love those velvet leggings! they look so warm and cony! Good for you! I'm sure that as a momma, blogger, and band member it is hard to make time for extra things! It's awesome that you are. Also, I love your outfit, especially the leggings! Lap steel/pedal steel are one of my absolute most favourite sounds! Good luck! i totally agree about that good ol' humbling feeling from starting a daunting new hobby. cause gosh, when you master that baby, it's going to feel SO good.